It makes sense that a “fabricator” like Harry Pendel would invent a life for himself revolving around literal fabrication – in this case, tailoring clothing for Panama’s elite. Harry Pendel’s first appearance leaves no doubt that he would be the go-to guy for any Panamanian’s sartorial needs. 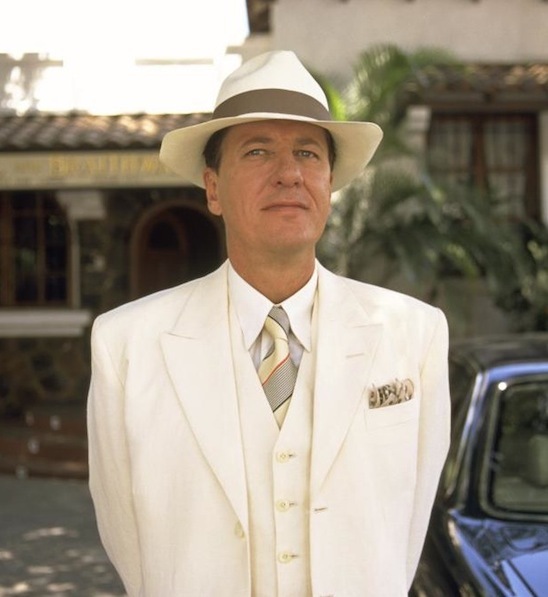 He strides out of his shop resplendent in a tailored three-piece suit constructed from a cream linen or linen blend as the title – THE TAILOR OF PANAMA – crosses the screen to both introduce the film and Harry himself. Though set in the modern day, Harry’s eye-catching elegance is a throwback to the more glamorous earlier decades of men’s fashion. This look – from his Panama hat through his peak-lapel three-piece suit down to his two-tone spectator shoes – evokes the late ’30s. The tailoring and style details appear to be exactly the same as the two pinstripe suits that Harry also wears during The Tailor of Panama. This particular suit was sold on ScreenUsed.com and the still-active sale page has great close-up photos of the actual suit that Rush wore on screen: “The cream colored suit consists of pants, vest and jacket and each piece has an ‘Angels’ costume label attached inside with ‘G. Rush, Feb 2000’ written in ink.” The costume label indicates that the suit was likely provided by the venerable Angels costume house in London. Harry’s 1930s-inspired suit jacket is single-breasted with three white buttons. The wide shoulders are heavily padded with subtly roped sleeveheads, and four smaller white plastic buttons fasten on each cuff. There is a single vent in the back. Harry’s suit in various states of cleanliness. Harry’s suit jacket has four external pockets – two straight flapped side pockets, a flapped ticket pocket above the right hip pocket, and a welted breast pocket where Harry displays a beige silk kerchief with dark polka dots. According to the ScreenUsed.com images, there appears to only be one inside pocket – a jetted pocket on the inside right. The peak lapels have a long horizontal gorge and a buttonhole through the left lapel. Harry’s classic-inspired detailing and lapels are seen as he talks to Marta. Harry’s matching waistcoat – as an English tailor, he wouldn’t call it a vest – has a five-button single-breasted front with the lowest button left unfastened over the wide cutaway notched bottom. There are two welt pockets. Although Harry told the president that he tries “to dispense with the rear buckle as a rule with your handmade waistcoat”, this waistcoat does have the adjustable buckle-strap across the cream silk back lining unlike on his light gray suit. In addition to being a masterful tailor, Harry can also whip up a mean breakfast. The pleats and full fit are seen as Harry paces around his back room. The trousers have straight on-seam side pockets and a jetted back pocket on the right side with no pocket on the left. The full break bottoms are finished with plain hems. They are appropriately full-fitting for linen. Harry’s two-tone leather bluchers are tan on the toe and vamps with a darker brown throat and laces. His beige socks are a shade darker than the rest of the suit. Poor Harry spends most of the film on the run from one entity or another. Harry wears it with a light cream cotton dress shirt that is just a shade off of white with a moderately-spread collar and a front placket. Although Harry has a preference for double cuffs with his suits, this shirt has button cuffs likely to reflect the relaxed look of the less formal linen suit. During most of the suit’s early screen time, Harry’s silk tie has thick beige and light gray that cross diagonally left-down-to-right with thin red and charcoal stripes separating the thicker striping. Later in the film, Harry again wears the suit with a gold silk tie that features hairline gray stripes in the right-down-to-left diagonal direction. Things have gotten serious by this point, so Harry doesn’t even bother with a pocket square or display kerchief. It’s been a rough night for Harry Pendel. Appropriately for the setting, Harry wears a cream Panama hat atop his head with a dark taupe grosgrain band. These kids know that when you see a guy dressed like this, there’s a good chance that he’s loaded. Harry lets his tailored clothing do his expressing for him, so he keeps his accessories minimal and practical. On his left hand, he wears his plain gold wedding band and a yellow gold watch on a brown leather strap. When something requires extra visual attention from Harry – like tailoring – he dons a pair of silver-framed glasses with ovular lenses and slim tortoiseshell arms. Harry is understandably nervous as the last time he was in this situation, he was subjected to hearing about Andy Osnard’s “windsock”. 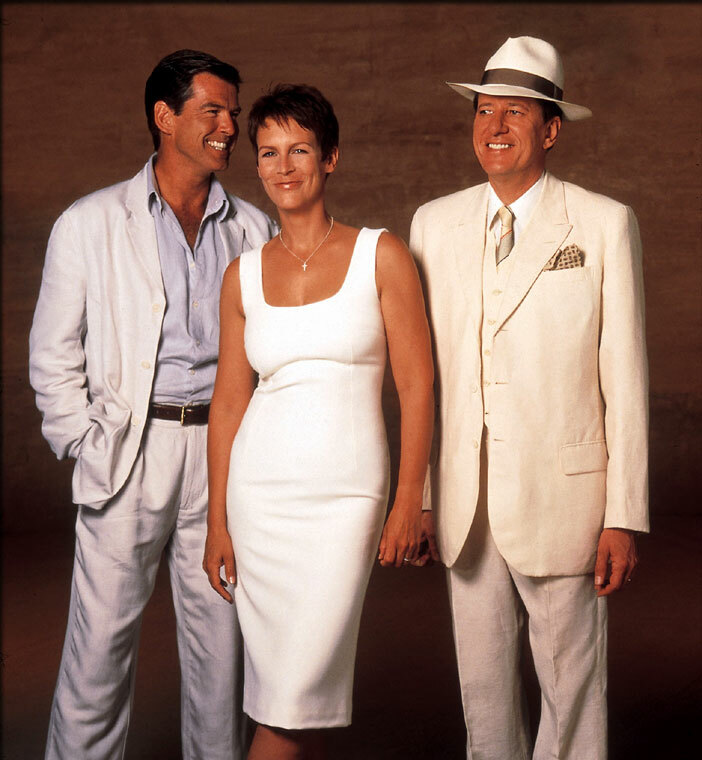 Yukking it up with co-stars Pierce Brosnan, Jamie Lee Curtis, and Geoffrey Rush. Buy the movie and be sure to read le Carré’s book. Welcome to Panama, Casablanca without heroes.